SEMACON S-2500 - Technology Unlimited, Inc.Technology Unlimited, Inc. 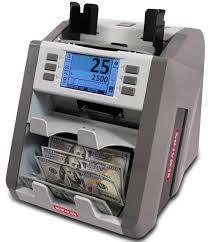 This currency discriminator features Semacon’s SmartDetect™ Advanced Counterfeit Detection System designed to accurately pinpoint suspect banknotes including ultraviolet (UV), magnetic (MG), fluorescence (FL), metal thread (MT) and infrared (IR) detection technologies. This discriminator was developed specifically for banks and other businesses with high cash volumes and is capable of continuous operation in the harshest environments.